A cyclist pedals down a traffic-free 1300 block of Chestnut Street on Friday, September 25, 2015, ahead of the papal visit. Ah, it's the eve of the City's Office of Transportation and Infrastructure System's Philly Free Streets, an event spurred by the love affair between Philadelphians and the roads left wide open from Pope Francis' visit to the city. On Saturday, the city's bikers, runners and pedestrians will be able to dip into some serious nostalgia by roaming the event that expands from South Street between the Schuylkill and Delaware rivers from 8 a.m. to 1 p.m. – free of any gas guzzling vehicles. 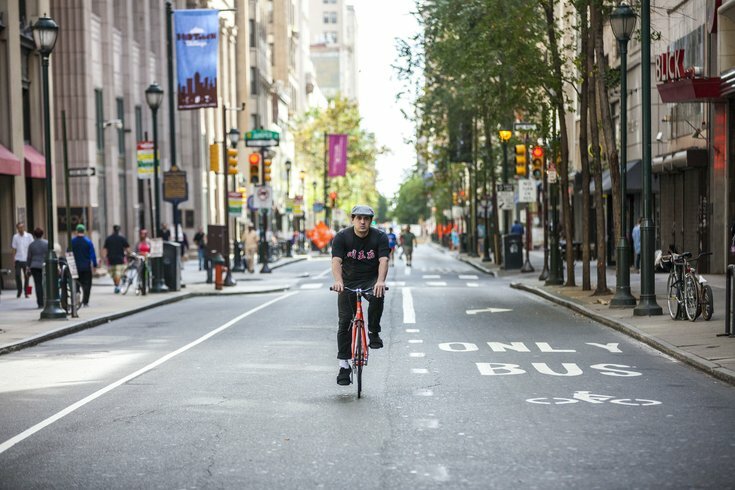 People were so jazzed about Philly Free Streets that, after the event was announced, the city was forced to expand the route from 8.1 miles to about 10 miles because of the "overwhelming response." Open Streets PHL, a nonprofit and one of the event's sponsors, said its goal is "to provide free and fun recreation to all members of the community by temporarily closing select streets to vehicle traffic while opening them up to endless possibilities of people-powered movement," according to its website. Saturday's path will weave down South Street onto the Schuylkill River Trail into Fairmount Park eventually stopping at Falls Bridge. Now what's there to do? A lot. There will be group runs and bike rides, a dance party, yoga, Zumba – oh, and a walk led by Mayor Kenney at 9 a.m. starting at 2nd and South streets.